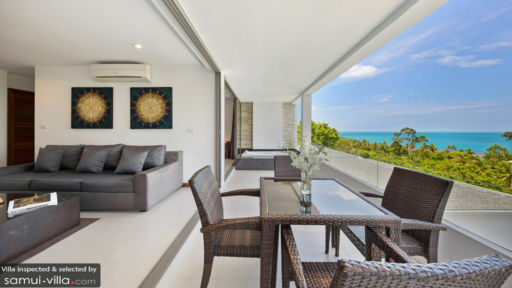 With a covetous location on Lamai hills, Samui, Tranquil Residence 2 is a one-bedroom private apartment, part of Tranquil Sea View Residence, which offers an excellent and enviable view of the sea with its dazzling waters. True to its name, the location affords a tacit agreement with the environment, ensuring you get a restful stay with no disturbances and interruptions. 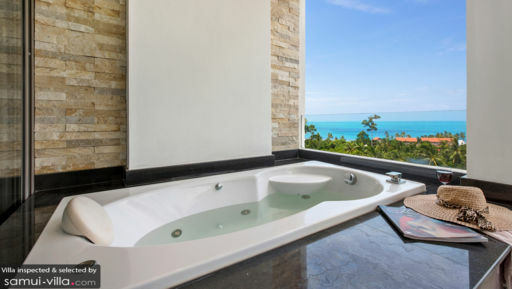 A Jacuzzi tub next to a glass wall has been placed in the bathroom, so you can enjoy a remarkable and tranquil time while having an enjoyable view. Close to the many attractions in Samui, the apartment is great for a tropical getaway close to the beach! The apartment has one private bedroom which is furnished with a king-sized bed and a plasma TV. There is ample wardrobe space for your belongings, and the contemporary aesthetics of the bedroom speak volume of the opulence of it interiors. The en-suite bathroom can be accessed through the glass doors that slide open to reveal a Jacuzzi tub that offers a 180-view of the sea from a glass wall. Being close to the beach puts you at an advantage as you can simply take a walk to reach the sandy shores. With a sprawling view including the sun, sand, and water, Tranquil Residence offers a calming and private ambiance for guests to relax, rejuvenate, and regain their strength. As you enjoy lounging on the balcony, have a meal on the alfresco dining area with a rattan table overlooking the sea. The four-seater dining table is great for a morning/ evening tea, lunch or dinner as you can bask in the beauty of nature and simply let go of any worries that may be troubling you. Tranquil Residence sports a contemporary and polished elegance in its decor with marble flooring, grey couches, a flat-screen TV, and false ceiling with spotlights. The crisp and refined decor puts you in an inviting and homely ambiance where you can laze on the plush couches as you watch some television. An entire wall is sliding glass doors that open out to the balcony with the alfresco dining area. The room is air-conditioned and decorated with indoor plants and selective artwork for a vibrant display. The modern kitchen is open-plan and also features a breakfast bar with barstools for quick bites. The state-of-the-art kitchen is fitted with western amenities including cooker hood, microwave, refrigerator etc. The entire space is airy and well-lit owing to the glass doors that can be left open during the day for the fresh breeze to flood the room. The guest manager at Tranquil Sea View Residence speaks multiple languages to accommodate various needs of guests. There is housekeeping and weekly maid service available for convenience as well. With 24-hour security, you can rest assured of your safety at the residence. A chef is on property as well, in case you wish to enjoy local fares and have yourself a feast! Guests can even request for sightseeing trips, excursions, car or bike rentals to explore the area. 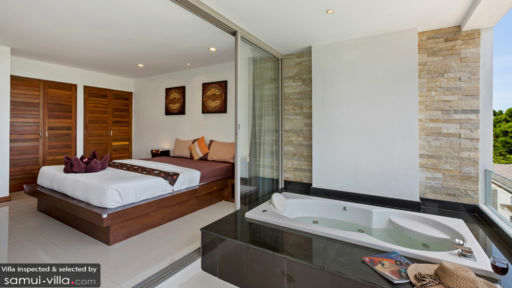 The residence has an excellent location putting you in close proximity to a lot of the main attractions in Samui including Chaweng beach which is a 15-minute drive. Visit Lamai centre for some fun activities, local food, and shopping! Head to the famous Grandfather and Grandmother Rocks which is a great spot for tourists!